A little Amish boy's silent connection with the man who brought the ice for the ice box. With no electricity or gas, refrigeration can be tricky. There are several ways the Amish keep foods cool. This story is about the ice box. I remember when I was young, very young, too young to work in the fields or help Dad with chores (that would be younger than 6 years), an ice man brought blocks of ice and put them into our ice box. The ice man was a tall, lanky fellow who brought ice in his special-made truck to keep ice from melting. The ice man wasn't Amish, of course, because the Amish didn't drive cars or trucks — or tractors, for that matter, doing their farming with horse-drawn equipment. The interior of the ice box was kept cool by the ice. It had thick, heavily insulated doors and walls. The block of ice was put into a special container near the top of the box with drains so the melt would go into a holding tray at the bottom of the box. The container for the ice was high inside the box because heat rises and coolness sinks. 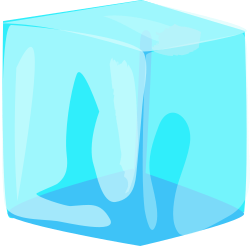 The ice in that position cooled the warmer air, and in turn, the cooler air moved down within the ice box and made room for other slightly warmer air to take its place. The ice box was used only during the summer. My instructions were to never open the ice box. Only Mom or Dad could do that. It was explained that they knew where on the shelves everything was located so they could open the door, grab what they wanted, and close the door quickly. The idea was that the less time the door was open, the less warm air got into the ice box. I recall that a glass of cold lemonade or something special for Dad when he got back from the fields was generally waiting in the ice box. Leftovers from meals were kept there, when there were leftovers that needed to be cooled. A cream container that slowly got closer to full, for making butter or cheese was there. And milk — always milk. Some milk sat in there long enough for the cream to rise to the top. 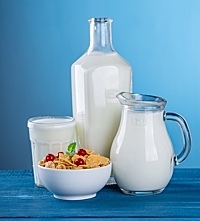 The cream was then skimmed off and the rest of milk used for drinking, eating with cereal, and cooking — when making gravy, for example, and I think Mom used milk in some of her bread recipes. But not chocolate. The ice box was too damp to keep chocolate. We had home-made chocolate candy only during the colder seasons, when chocolate could be kept on the cool porch in a special closed container. I don't recall much of what other food that was and was not in there. I guess I was too young. Or, not being allowed to open the ice box, its contents never impinged on my memory as much as other related things. 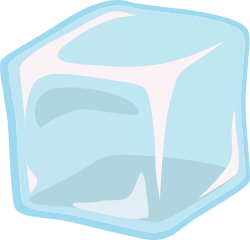 When the ice man came on his regular delivery schedule, he found a ticket for the amount of ice to put into the ice box. My parents paid for a booklet of tickets in advance. The system worked well because neither Mom nor Dad had to return to the house to pay the ice man if they were in the garden or fields. I liked to watch the ice man. He would tell me what he was doing. At least, I think that is what he was telling me. He spoke English and I spoke the special language the Amish speak. He would tell me what he was doing when he shoved some ice left in the box to one side so the new ice could fit in there with it. He would look at me, point to one of the ice pieces, say something, and move the ice. Everything he did he commented about, indicating an ice chunk, an ice pick, or something else he was working with, and look at me while he talked. Sometimes he chopped a piece of ice into two so it would fit. And sometimes, if he only had chunks larger than the ticket asked for, he chopped the large piece so a piece of the right size broke off. He had an ice chisel and an ice hammer and he always broke off the right size piece. All the time he worked with the ice he was telling me what he was doing, or so it seemed. Maybe he was telling me about his family; I wouldn't have known, understanding only a few English words. Regardless what he was saying, it sure felt nice to have the voluntary attention of the ice man. I still remember a one specific time the ice man came. Mom was in the garden harvesting something; I don't remember what. But it was end of Summer, the weather at night being colder. The leaves on the trees were starting to turn color. I was on the front steps waiting for the ice man. Mom had told me he was coming that day. It was his last trip of the summer, she said. And I wouldn't see him again until next summer. He came. He waved at me and smiled, but he didn't say anything. Occasionally, he smiled at me while he put the ice in the ice box. But he didn't say anything. I wondered why he wasn't talking to me like he always did before. When he was done, he took an envelope out of his overall pocket and hung it on the handle that opened the ice compartment of the ice box. He said something then, walked to his truck, and waved as he was driving off. The ice man had never left an envelope on the ice box handle before. So I meandered to the garden and told Mom, "The ice man left a paper on the handle." "On the ice box door handle." Mom hurried to the porch where the ice box stood. She opened the envelope, pulled out the paper, and stopped moving. Then she said, "William, sit with me on the porch steps." When we had seated ourselves, she said, "William, the ice man isn't coming back." "Yes, you told me, Mom. Not until next summer." "William, I mean he is not coming back ever." The ice man was the only non-Amish friend I had. He paid more attention to me than anybody, except for my Mom. He talked to me, even when I couldn't understand. And he never told me, "No". What was I going to do now! I think my face contorted and crinkled up. I was about to cry. But Mom held me close. "But the ice man was my friend." An expanded version of this story, including the reason the ice man wasn't coming back, is in Amish Candy Recipes (tentative title), a book planned for October release. Did this inspire you? Raise a question? Stimulate something you wish to say? If yes, tap here and put it in the public comment area. Be notified whenever a new story, recipe, or technique is posted.